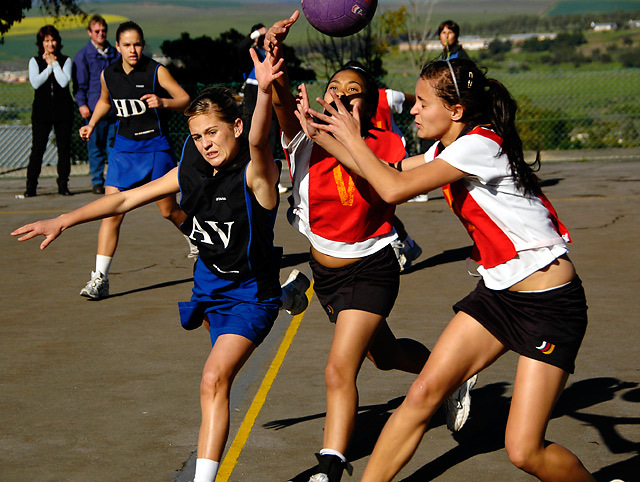 Taken at a school netbal match. Those girls are tough! this would be more effective if all of the ball was showing, IMHO. Nice work at stopping the action and getting the expressions on the faces. Only suggestion I might make is a little different crop, to see the top of the ball or showing more at the bottom so the feet weren't chopped at the ankles. nice moment. it could stand to have been more tightly framed, eliminating a lot of the distracting background. What game are they playing? The ball looks like a volleyball, but the players are in the same court area. You've certainly captured 'Stopped Motion' here. Not seeing any motion trails/blur anywhere. I do find the gal in the back left distracting as she's drawing my attention out of the main subject area (I like her pose and obvious involvement in the action). Good luck in the challenge. I think if you could have cropped more off the bottom and gotten the whole ball in frame it would have been better. looks like skinned knees just waiting to happen! I love this shot. Great Motion stop. its a real shame you cut off their feet and the top of the ball. Composition is pretty good, I do like the three subjects all fighting over the ball. I would have liked to see the whole basketball in the frame. The background subjects are hurting you here as it makes this shot seem really busy to me. Also the cut off feet take away from the action. You have very nice tonal range throughout the shot that is pleasing to the eye. What I would have done different is shot at a lower f-stop to keep the focus on my foreground subjects and blurred out the background subjects, this would give more emphasis on your three main subjects. I give this a 6. Proudly hosted by Sargasso Networks. Current Server Time: 04/24/2019 12:05:42 PM EDT.